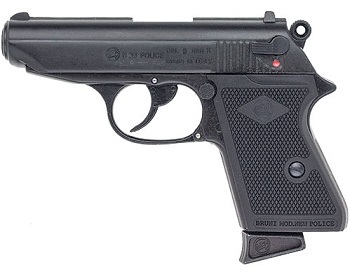 Image Below Or Add To Cart Bruni PPK 9MMPA-Black: You recognize this gun as the Famed World War II PPK Automatic Pistol that was also a favorite of Secret Agent 007 James Bond and used by all international security forces. This blank firing Replica pistol fires single or double action just like the original. This 9MMPA PPK Model features checkered composite grips, a removable Clip like all of our blank guns and a working Safety. It fires 5 9MMPA Rounds as fast as you can pull the trigger. It is great for Collectors and Stage or Movie Prop and War Reenactments Blank Gun Prop. It comes with a Magazine as do all of our Automatic Blank Guns. Caliber, 9MMPA, Length 6" total, 3” Barrel, Weight 1 lb 8 oz.